There are four passes on this trail, there are passes on left right and center. Reason Ladakh has its name from La (Pass), literally meaning Land of the High Passes. We visit the ancient monastery of Lamayuru, cross Prtingi La (3500 meters), Panji La (3400 meters), Kongske La (4900 meters), Stakspi La (5000 meters) as well as many beautiful views of the East Karaokaram, Ladakh Range and the rugged ridges, rock spires and snow capped peaks that define the true dimensions of the Zanskar Range. This is an outstanding trek and an ideal introduction to the visually stunning and culturally rich region of Ladakh, high in the Indian Himalaya. We explore this rugged land characterized by exquisite Buddhist monasteries and ancient forts where the snow leopard seeks out the highest ridges at the margins of the season and camp in spectacular terrain on the borderlands of Tibet. This trek visits the hidden valleys of Ladakh region crossing the high ridges of Zanskar range to Buddhists villages and gompas beyond the Indus valley. Lamayuru has a camping ground below the escarpment which perch the 11th century monastery and its guest house. There are several guest houses and restaurants in Lamayuru.It takes 3-4 hours from Leh to Lamayuru, one of the oldest sites in Ladakh. Enroute we will visit the famous Pathar Saheb Gurudwara, Magnetic Hill, Confluence point and beautiful villages of Ladakh. According to the legend that there was once a vast lake which filled the upper reaches of the valley and Sage Naropa miraculously breached this, thus the site of the breach was revered and became the location of the gompa which was built in 10th century. In recent years Lamayuru as well as a number of other gompas in Ladakh have changed their annual masked dance festival to the summer for convenience of tourists, which was earlier held in long winters. We stay here tonight and enjoy the beautiful scenes as well as the tour of the monastery. Its a hot trail today as the temperature here reaches up to 30 degree Celsius in summers. So its best to start early from Lamayuru as we trail down from the stream and then turn up at a side valley towards prayer flags. 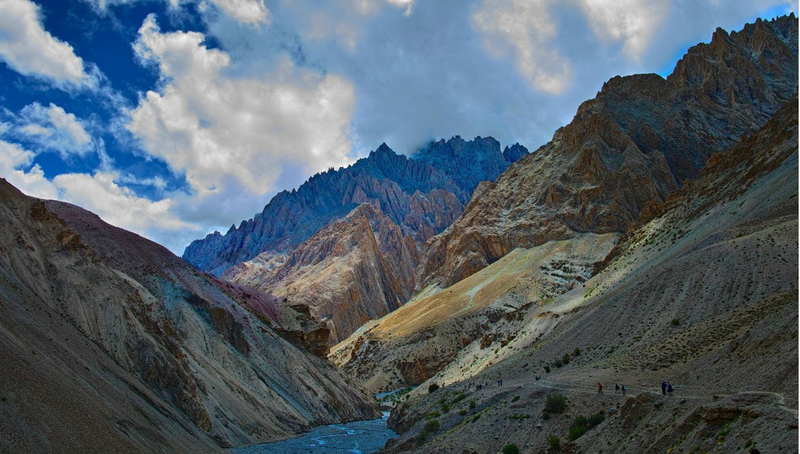 Then the trek ascends way up through a barren gorge of yellow loess clay toward Pritikingi La which offers us views across the barren landscapes of the Zanskar Range. From the pass trail enters a narrow gorge down to the Shikalong Valley. From here Wan-lah Monastery which is just as old as Lamayuru monastery and is just a kilometer walk as it offers a commanding view of the Shikalong Valley. We camp here tonight. From here our jeeps would take you towards PanjiLa Pass (3400 meters) from here we start our trek towards Panji La from a split. It boasts of a school and apricot orchards. The fields extend vastly upto a few kilometers towards Hinju. Around 3 hours walk from here after crossing some bridges, settlement and main Hinju Village (3800 meters) we reach our camp site. It’s a beautiful meadow located near the rain fed streams joining into the Zanskar river. We camp here tonight. It's a relatively easy climb above hinju through several summer pastures. As we reach the shepherd's settlements the path leaves the stream and climbs steeply for another couple of hours. The views from the Kongske La (4900 meters) are mind blowing. We can see the mountain peaks of Alam and Palam (5900 meters). To the south their are peaks of Zanskar, to the west the peaks above Suru and Batalik near Kargil and over north, the Nubra-Shayok Peaks over Khaltse. The other side of the pass descend is over loose scree and sometimes snow and ice moraines. Then the pass goes steep down along Sumdha Chu for a few hours until we reach our camp at Sumdha Chenmo (3900 meters) below the vast grazing ground amidst hundred of yaks, sheep and goats. Be careful of the sheep dogs though. There is another route following the Sumdha Chu river towards it confluence with Zanskar and reach out the Highway and proceed towards Nimmu - (Famous white- water rafting site) and further towards Kargil. We camp here at Sumdha Chenmo tonight. This is an easy trail moving south-east, crossing many grazing areas with many stream crossings. If water levels are low, we stay along the river, if high we will traverse the cliffs for about and hour or two. We leave a bridge and go towards the path leading towards a gorge towards a stream. We stay on the main trail road and have to cross several river crossings and after a long walk of 4-5 hours reach Sumdha Chun. This place has a beautiful monastery (gompa) from the Alchi era build by workers from Nepal over 200 years ago. We camp here tonight. Today would be a difficult day so we leave early around 5 am. The climb to the pass is steep and difficult and can take 4-6 hours to ascend the scree laden path. We come across a small tributary near a campsite where we can fill our water supply and stop over for some refreshments. The last section is over rocky ground marked by cairns. However once we are atop we get magnificent views from Stakspi La (5000 meters). The descent to the north is sharp over rocky terrain towards the spur, then we have to cross the river a few times to the grazing grounds. We can camp here tonight if we want or move ahead towards Alchi which is another 3 hours from here. Here we will found many guest houses and restaurants at Alchi (3150 meters) and a famous 11th century Monastery with amazing frescoes still intact. The artistic and spiritual details of both Buddhism and the Hindu kings of that time in Kashmir are reflected in the wall paintings in the monastery complex. These are some of the oldest surviving paintings in Ladakh. 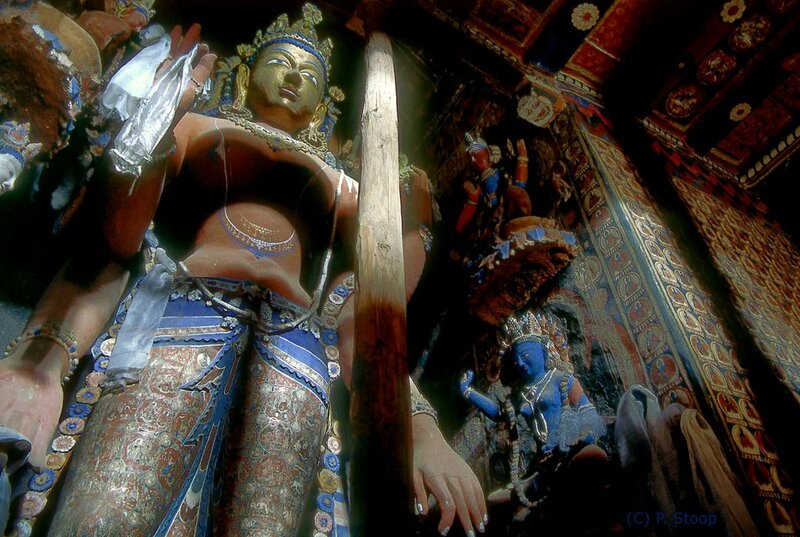 The complex also has huge statues of the Buddha and "lavish wood carvings and art-work — almost baroque in style. We stay here near the camping grounds tonight.